The last level was tricky in its own right but the biggest headache was caused by the straightforward task of picking up the ion drive. It was at the bottom of a little hole that my jetman insisted on skipping over every single time I tried to fly down it. In the end I tried swapping to joystick control as a last resort and much to my surprise it did make steering around a lot smoother. Whether it’s an emulation oddity or the game genuinely supports analog joysticks I don’t know but it allowed for slower flying and I could complete the game this way. A HOTAS joystick with a range of movement that is clearly too large even for flight sims isn’t ideal for this game but it also made it easier to stay alive so was of double benefit. The first time I played this game four and a bit years back, I wondered how anyone was ever expected to finish it but there was less of a challenge that I expected to be honest. With the finished map I reckon I could have a good shot at completing in one go now, but I’ll spare people any more videos of me playing 30 year old games for the moment. I doubt it’s made for rivetting viewing as it is but I’ve enjoyed myself at least. 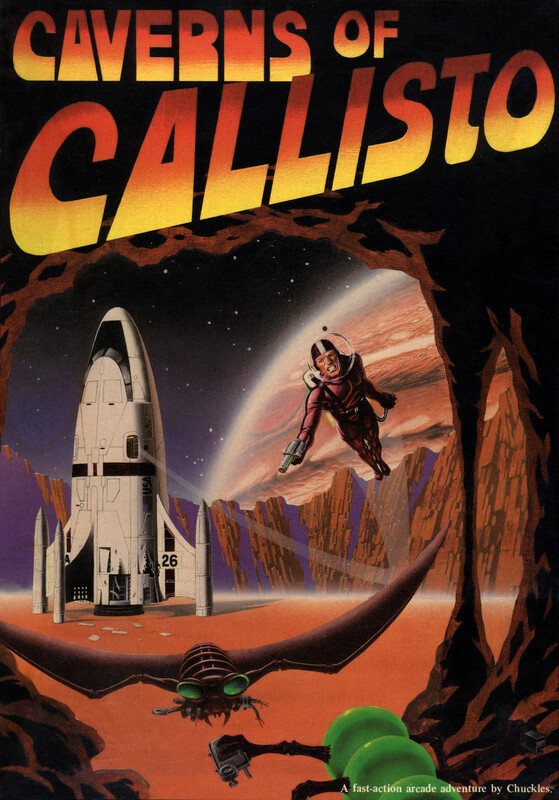 Caverns Of Callisto is clearly no classic and can hardly justify the pricetag on its gameplay alone but it is a fun little arcade shooter for 1983 and deserves better than just being left sat on a collector’s shelf. The levels are getting harder at this point and I’m finding my laser blaster does have a use after all. 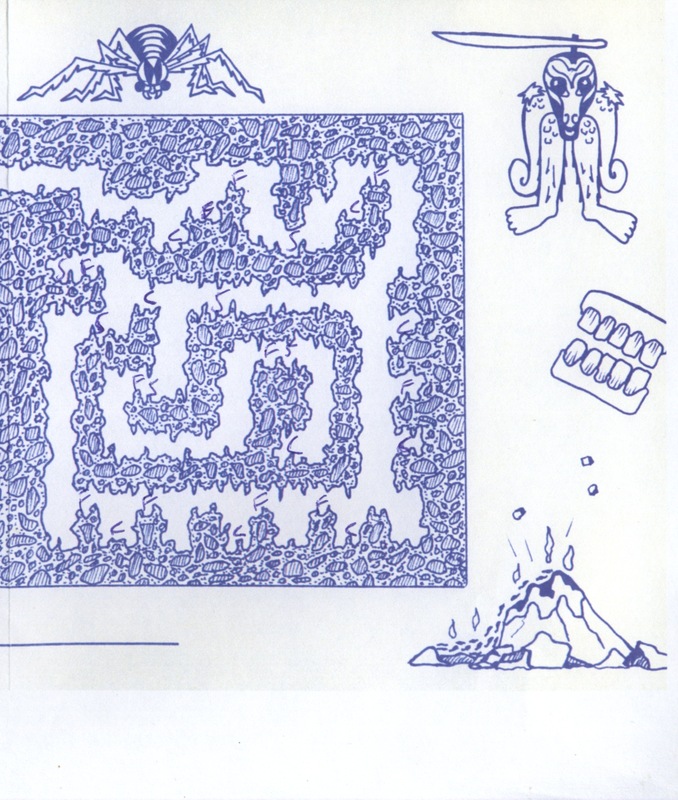 This is going to be especially true in level 5 which I’ve still only got half mapped out. 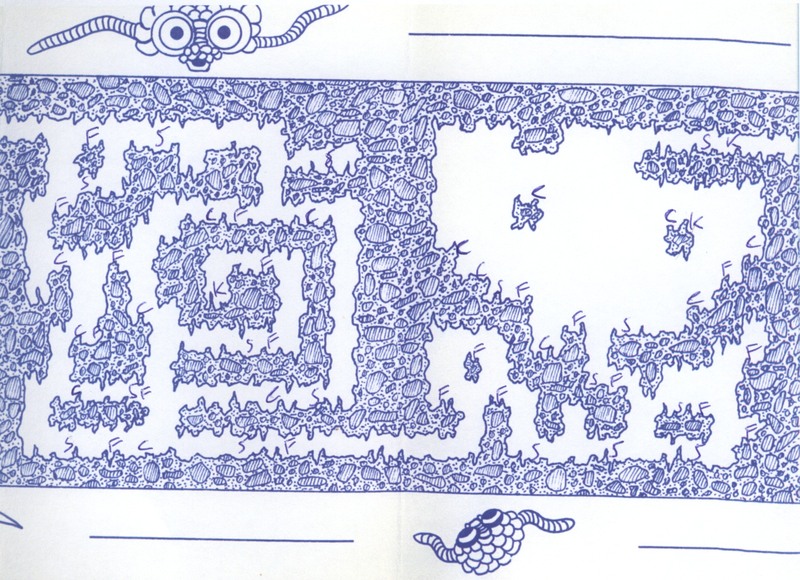 I’ve seen enough to recall that it ramps the difficulty way up with narrow twisty corridors and lots of critters. The concluding part 3 will be up next if I can finish it. 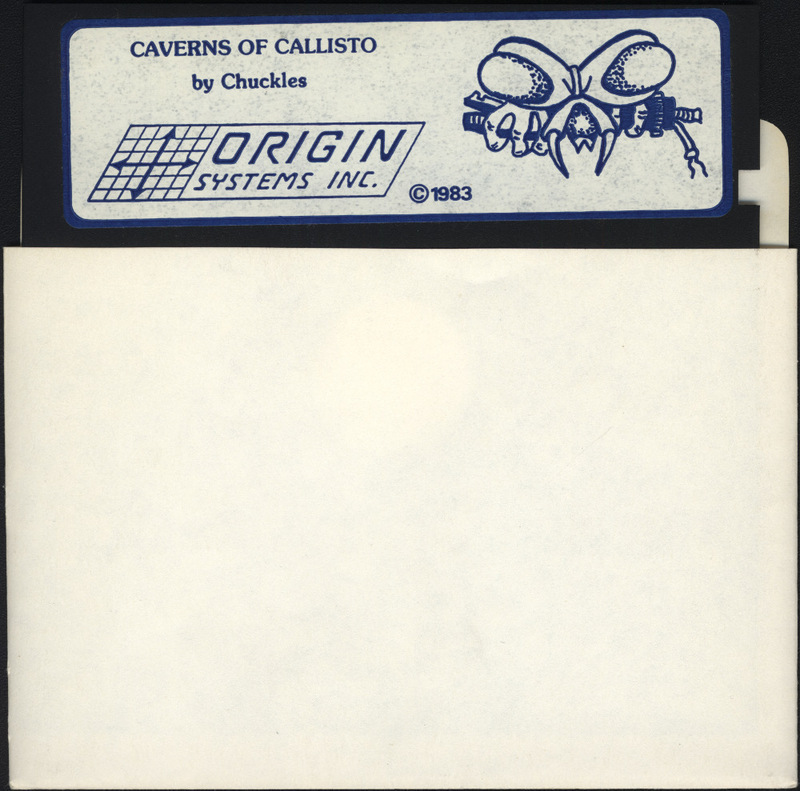 Caverns Of Callisto was Origin’s second game published way back in 1983 in their first year. 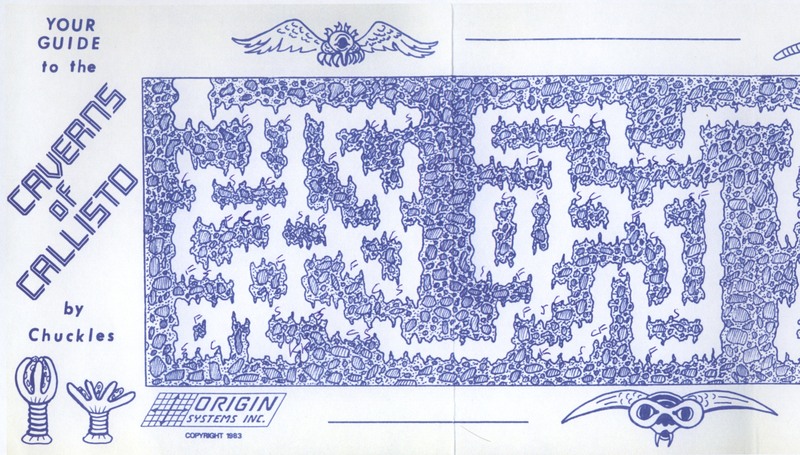 It was written by Origin’s only founder who wasn’t part of the Garriott clan, Chuck Bueche (aka Chuckles) and was an arcade game involving flying around a maze-like cave system collecting objects. The game didn’t get the widest release only ever coming out on Apple II and Atari 8-bit which has led to its main claim to fame in that it is ludicrously hard to track down a copy. I finally managed this at 3am last boxing day after years of looking. After the effort and expense involved, I was always going to have to play it again at some point and enjoy it if it killed me. I savestated my way through the first time around so I thought I might as well do things properly and attempt a longplay while I was at it. I’m still going to cheat slightly and do it in 3 parts using a savestate at the end of each one. In the game, I get to play an astronaut on a routine patrol to Callisto. When I get there I find the station destroyed and my ship beset by monsters who steal all its vital parts. Stranded in a hostile environment I have to venture forth into the subterraneous “Caverns Of Callisto” to retrieve them. After spending way too many hours on Batman Arkham Asylum this week, I was in the mood for an older game and I’m enjoying playing this again. Jotting down notes and navigating using a paper map is quite the oldskool experience. It’s well judged in terms of difficulty with my main problem being that I could have done with a pause button to look at the map and get my bearings. Glancing at the manual in hindsight, I realise now that Escape pauses the game which should help no end with part 2. I can’t say that there is much use in shooting the aliens as it’s usually easier to run away or fly offscreen and back which conveniently makes them vanish. The jerkiness of the controls doesn’t help here with aiming being difficult and it’s occasionally tricky to pick up items with the little jetman skipping over them. You’ve got to allow leeway for a game this early though. It’s still entertaining and very reminiscent of the sort of thing I used to play on the ZX Spectrum as a kid. Assuming I can finish them, levels 3 & 4 should be up next. A full set of Origin games! I’m back home again after doing a tour of the family homes over Xmas and apart from being a little tired, raring to go with the next Origin demo. Boxing day is made for gaming as far as I’m concerned and I intend to make the most of it. The main reason I’m tired is that I was up in the middle of the night bidding on my personal collecting holy grail, Caverns Of Callisto. It figures that I wait years for a copy to come along and it arrives right at the most expensive time of the year, just after I’ve already spent a small fortune. I didn’t let it put me off as I’ve been looking for a copy for so long it was going to be mine the moment it was listed no matter what it took. It finished way, way under what I was prepared to spend. The last copy I saw on Ebay went for $100 more and didn’t even have the box so I’m considering it a bit of a bargain. Others may disagree but it was worth more to me. Anyone who has read much of this blog will know that I’ve been looking for this game for over a decade and have been mentioning it as often as possible in the hopes that someone would offer to sell me one. When I get my hands on it in a few weeks that will at long last complete the set of every Origin game and book about 12 years after I started collecting them. Granted I could and no doubt will keep going with foreign/alternate versions and various other bits and bobs but all of that is optional extras. Top of the list now would be the soundtrack CD’s, NES Ultima 5, SNES Savage Empire & SNES Ultima 7, 3D0 WC3, WC3 & 4 Playstation and the toolkit for Autoduel. The soundtracks will be tricky but the rest won’t take too much finding. Any of that stuff will have to wait though. After recent weeks, my new years resolution is to not spend a single penny on anything to do with gaming until April. We’ll see how long that lasts…. 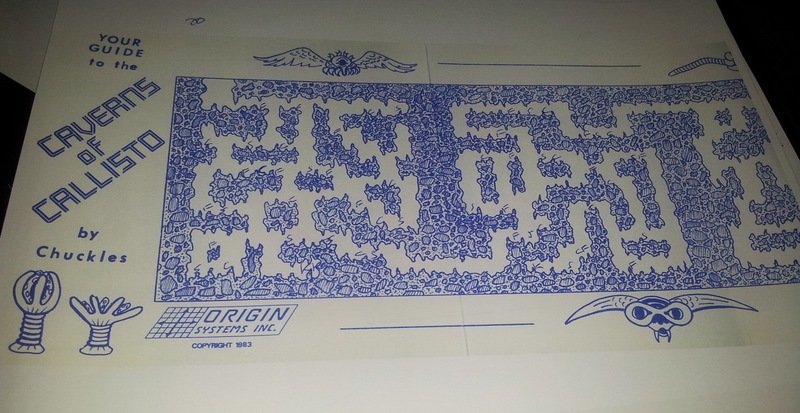 In the meanwhile, I’ve got a whole parcel of Origin goodies to go through. Expect to see something a little bit special for the Wingnuts on here later.